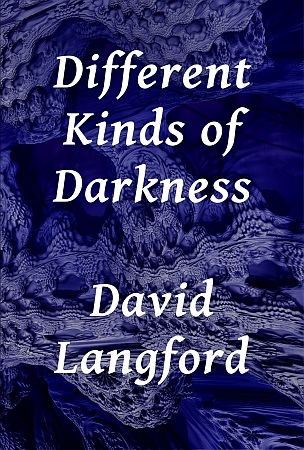 Different Kinds of Darkness, at last published in ebook form in May 2015, is a retrospective collection of David Langford's "straight" science fiction, fantasy and horror short stories – excluding parodies and pastiches, which are collected in the companion volume He Do the Time Police in Different Voices. The ebook contains the full text of the 2004 edition plus six extras as listed below, increasing the story count from 36 to a cosmically significant 42. Total length of ebook: approximately 126,000 words. Click the top button below for a full description of the 2004 book's contents at the Langford site. The next button down takes you to a selection of review quotations. Cover image: ChaosPro fractal generator.